Home > Common Eye Conditions > What is Glaucoma? Glaucoma is one of the most common eye conditions and affects around 2 per cent of people aged over 40 years. There are over 500,000 people in England and Wales with the condition. However it can be easily treated and managed if caught early enough. Early detection is crucial to minimise any potential sight loss. In many cases good vision can be preserved and any loss in vision can be slowed down. There are 4 main types of glaucoma - the most widespread is chronic glaucoma. All types of glaucoma occur as a result of damage to the optic nerve which is caused by raised pressure in the eye. Pressure rises in the eye when the liquid produced by a layer of cells behind the iris cannot drain away properly or if too much liquid is produced. When the pressure increases it places a strain on the optic nerve, causing damage. Acute glaucoma occurs suddenly when there is a complete blockage of the fluid and this can cause permanent damage to the optic nerve if it is left untreated. This type of glaucoma is not very common in western countries. Other types of glaucoma include secondary glaucoma which occurs when the rise in pressure in the eye is due to another eye condition. Developmental or congenital glaucoma is also rare. This condition affects some babies and is caused by malformation in the eye. Many people will not experience any symptoms and their sight may seem perfectly normal. This is why it is important to have regular eye tests to check for glaucoma, especially as you get older. Some people find that their vision in one eye starts to deteriorate. 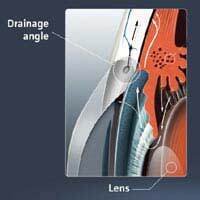 As the glaucoma worsens their centre of vision is the last to be affected resulting in so-called tunnel-vision. Acute glaucoma, when the fluid in the eye becomes completely blocked, can be painful as an attack comes on very quickly. There may also be nausea and vomiting. Treatments are effective when the condition has been caught in the early stages. All treatments reduce the pressure in the eye and can consist of eye drops, tablets, laser treatment or surgery. For chronic glaucoma eye drops are usually prescribed to reduce the amount of liquid in the eye and improve drainage. It is imperative that patients continue to use the eye drops even if their vision seems good. A patient's sight may appear normal but it could be getting worse without them noticing. Acute glaucoma needs immediate treatment in a hospital. Drugs will be given to reduce the pain and pressure. Laser treatment or minor surgery will be needed but is not painful. The ophthalmologist may advise treatment in the other eye to prevent the condition developing in both eyes. The risk of developing glaucoma increases with age. 5% of people aged over 65 years have glaucoma. The condition can affect babies and younger people but this is rare. Some groups of people are more at risk than others. Those from African-Caribbean origin or those who have a high level of short-sightedness are more at risk. Some studies have shown that people with diabetes are also more likely to develop glaucoma. Early detection is vital to limit and control the disease. Everyone should have regular eye tests every two years but if you are in one of the risk groups, it is even more important to have regular checks. If you have a close family member aged over 40 with the condition, that is a mother, father, sister or brother, you are entitled to a free NHS eye test every year. I SUFFER FROM GLAUCOMA FOR WHICH I USE LUMIGAN EYE DROPS EVERY DAY BUT I ALSO SUFFER WITH SEVERE ITCHY EYES FOR WHICH I HAVE BEEN PRESCRIBED HYPROMELLOSE EYE DROPS BUT CANNOT SAY THEY HAVE HELPED MUCH. DOES ANYONE HAVE THIS TROUBLE. IF SO, WHAT TREATMENT DO YOU FIND HELPS.